His father was Fusaosuke and his mother Yaso. 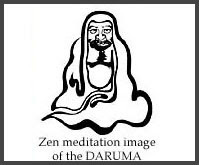 He was a samurai of the Matsuyama Feudal Domain, born in the Residence in Edo. 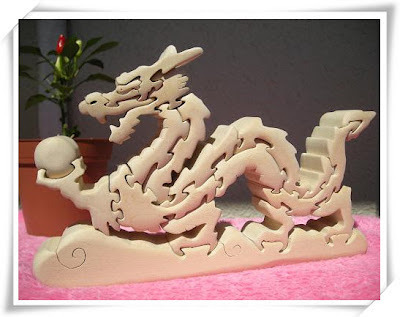 He was interested in education and literature, especially the Chinese classics. 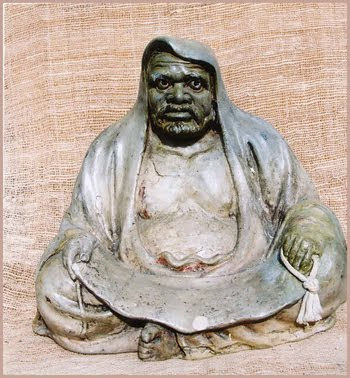 He became caretaker of the dormitory of Tokiwa-kai. 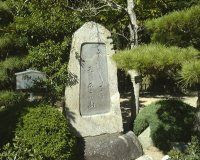 He became a friend of Takahama Kyoshi at age 46 although he was 20 years his elder, and started to write haiku too. 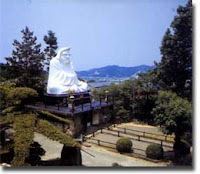 He achieved great fame for his poetry during the late Meiji and Taishō eras. He died in Azabu, Tokyo at the age of 80. This haiku is by Naito Meisetsu (1847-1926), another Matsuyama haiku master. 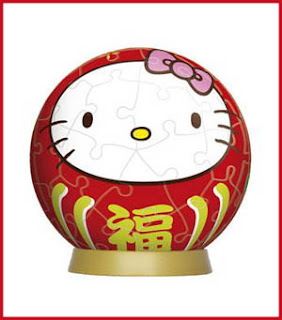 It is a celebration of the New Year, in a rather nationalistic vein, mentioning the unbroken tradition of the imperial house and Mt. 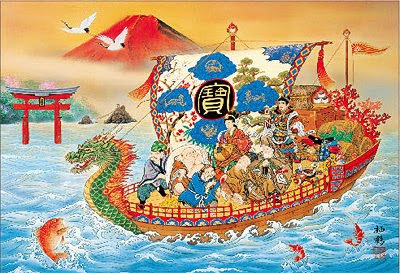 Fuji as the two most characteristic symbols of Japan. 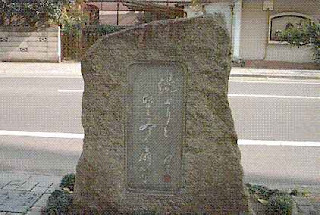 Although by no means the best haiku of Meisetsu, it became the first kuhi that was set up in Matsuyama. This was already in 1918 - the first kuhi for Shiki would only be set up in 1933.
that on the coffin lies. can lead a horse by hand, or sit on it or be the driver of a carriage. But still his little silver bell persists. 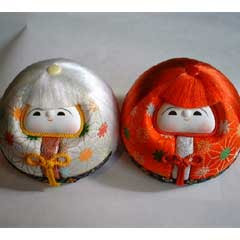 This white Daruma statue is made from the sands of battlefields of WWII in order to pray for peace around the world. 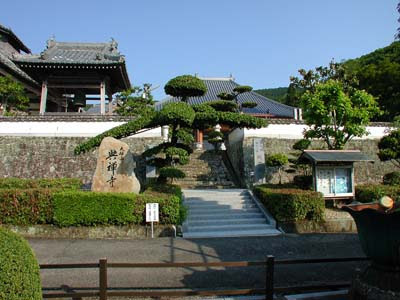 The temple itself has a history of more than 2000 years. 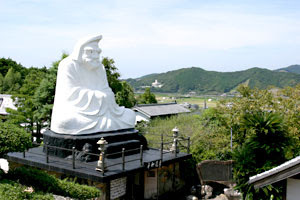 It is one of the most famous ones in Wakayama prefecture, with a famous statue of Kannon Bosatsu and a collection of old scriptures. In the famous garden, where people can walk around, the azaleas are the most famous when in bloom. 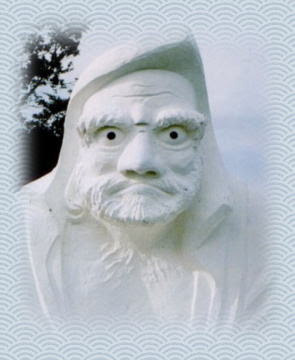 The white Daruma statue was constructed in 1973 昭和４８年. 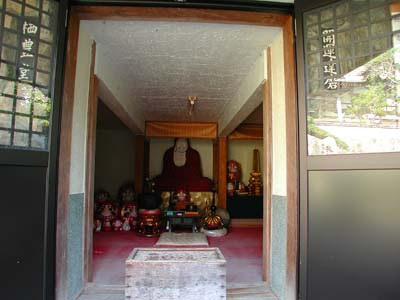 Since then, the temple is better known as "Daruma Temple". 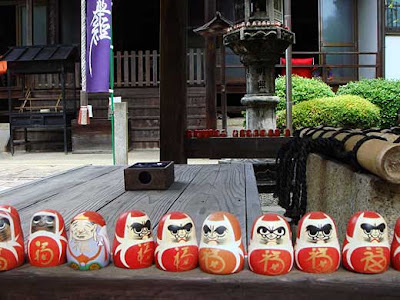 It is one of the eight famous Daruma temples in Japan. Click HERE for many more photos of the temple ! Click on the thumbnail to see many more! 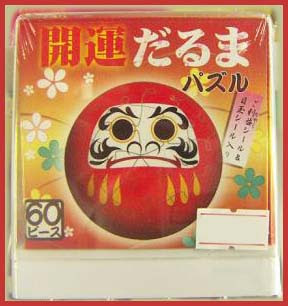 Tanzaku are mostly written for the Star Festival, to hang them on a bamboo pole. My name is Jake Benson and I am a paper marbler and bookbinder. One thing that I am very interested in is the use of Japanese marbled papers, or suminagashi paper for tanzaku panels. Many haiku poets used this kind of decorated panel, in addition to many other kinds of decorative papers or ryoushi for their works. Some are further embellished with kirihaku, or cut metal leaf work, similar to maki-e seen on lacquerware. To me such panels are not only to be appreciated for their meaning, but their powerful visual imagery that they convey. 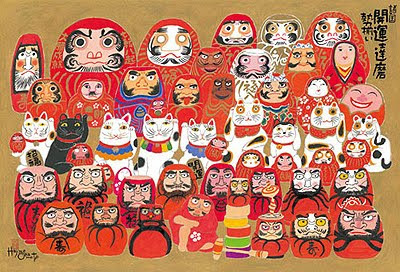 Very recently, I came across a HUGE collection of beautiful digital images of many tanzaku online, from the collection of the International Research Center for Japanese Studies. Here are the links to tanzaku featuring suminagashi; click on the image to load it in glorious detail. I'm still trying to find out just WHO the poets are and WHAT they had to say. The Kanshi Poems of the Ozaka Tanzaku Collection : late Edo life Through the Eyes of Kyoto Townsmen. 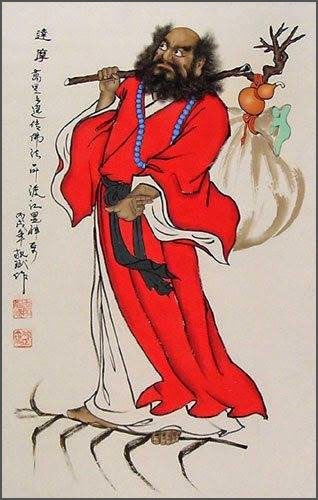 An Anthology of Kanshi (Chinese verse) by Japanese poets of the Edo period (1603-1868). Dance of the Butterflies: Chinese Poetry from the Japanese Court Tradition. If you can make it to Washington DC, a fabulous exhibition, "East of Eden", is devoted to the depiction of Gardens in Asian art. A friend and fellow marbler Milena Hughes sent me an image of a six panel byobu folding screen in the Art Institute of Chicago. As I mentioned, there are a pair of byobu with 6 panel folding screens each that feature large trees by a pond of silver at the Freer exhibition East of Eden. Among the many items on display, there is an early 17th c. album that contains 30 pairs of paintings illustrating scenes from the "Tale of Genji" along with poems by various court scribes. All of the poems are written upon suminagashi paper. The leaf on display (#31) features a nice "whorl" of ink further decorated with kirihaku and noge (cut gold and metal leaf, in various shapes). It is a bit different from leaf #30, which you can see in the Freer collections database. 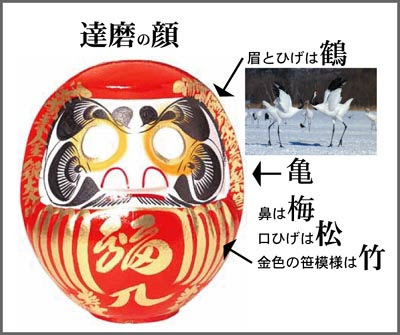 The description mentions that it is thought that they may have once decorated a folding byobu screen. Also on display is a pair of 6 panel folding screens that feature large trees by a pond of silver. Individual tanzaku panels have been pasted to the screen to give the effect that they have been hung from the trees. 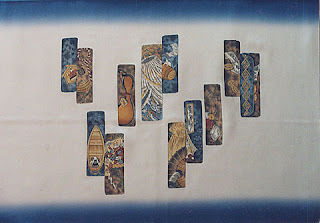 The tanzaku feature a variety of decorative papers, including kumogami (cloud-paper, blue banding similar to arbling, but made with poured blue pulp) as well as kirihaku. 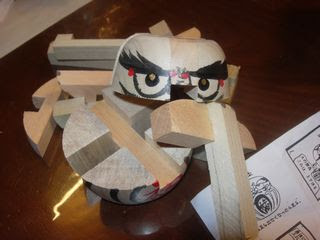 Unfortunately, you can only see a small clip of the image of this byobu on page 3 of the interactive tour. 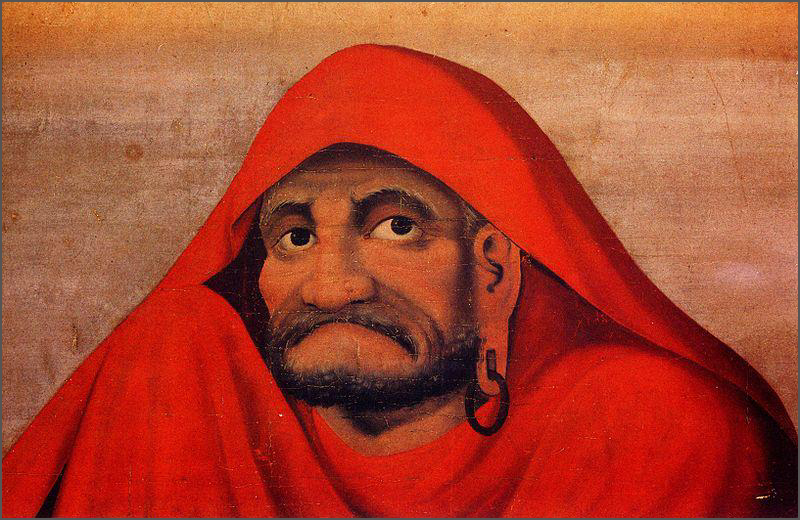 Click on the interactive tour, then on "east Asia", and then click on "gallery". An image will load, but more are featured. The pair of Byobu that I'm referring to is image #18. 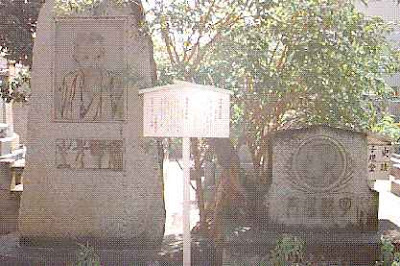 ... the tanzaku panels appear "as is recently tied to the branches following a spring poetry party or composition". 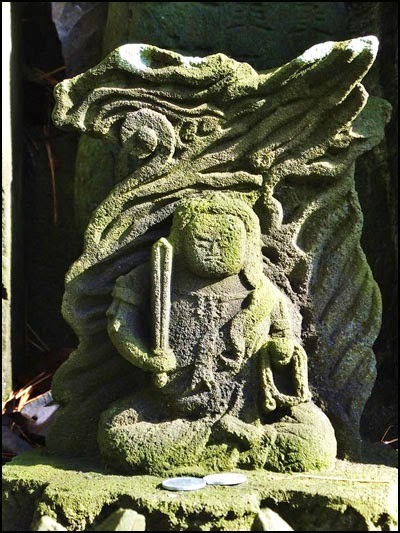 It also mentions how this practice "...of tying them to branches or donating them as offerings to the gods first started at court and then spread to other classes of Japanese society." Unfortunately, no mention is made as to when this practice may have started. Seeing these images makes me I wonder whether there is a tradition of hanging of tanzaku in seasons other than during the Tanabata festival. Could it be that is just what survives as a popular the practice today? Please enjoy this virtual a feast of Japanese decorative papers, tanzaku panels, and poetry! 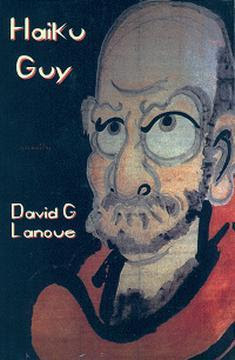 短冊の歴史 (History of Tanzaku) Japanese. GOOGLE for more tanzaku photos ! 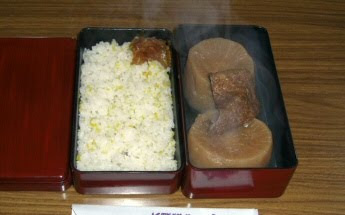 GOOGLE for more 短冊 photos ! The square of a shikishi. 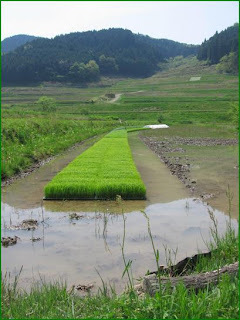 The seeds of rice are planted in square and rectangular-shaped beds which resemble the tanzaku and shikishi. The poetry lies in the fact that the things compared are remote materially but identical in form.